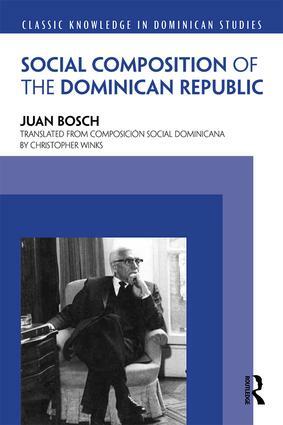 Composición social dominicana (Social Composition of the Dominican Republic), first published in 1970 in Spanish, and translated into English here for the first time, discusses the changing structure of social classes and groups in Dominican society from the first encounter between Europeans and Natives until the mid-twentieth century. This influential and pioneering book details the struggles of the Dominican people as they evolved from pre-colonial and colonial subjects to sovereign actors with the task of moving a republic forward, amidst imperialist desires and martial ambitions. Juan Bosch, one of the most well-known and best-loved Dominican politicians and scholars, here sets out the important themes that define modern Dominican society. He tackles topics such as the inter-imperialist rivalry between France, Spain, England, and Holland and its subsequent impact on the Caribbean region, as well as the U.S. occupation of the Dominican Republic from 1916-1924. He also discusses the aftermath of political alliances between liberals and conservatives during the birth of the Dominican Republic, the Restoration War fought against the Spanish Crown, the role of the petit bourgeoisie and the hateros (cattle-ranchers) in the formation of a Dominican oligarchy, the emergence of dictator Rafael Trujillo, and the composition of society during his time in power. This translation, introduced and contextualized by leading Dominican Studies scholar Wilfredo Lozano, opens up Bosch’s work for a new generation of scholars studying the Caribbean. This excellent translation captures magnificently the superb qualities that combined to elevate Juan Bosch to the highest echelon of Caribbean intellectuals. He was enviably well-informed, incredibly thoughtful, uniquely insightful, powerfully articulate and zealously determined. His impressive command of the history of the Atlantic World rivaled his commanding knowledge of the Dominican Republic and that made Juan Bosch not only an extraordinary nationalist but also an outstanding Caribbean internationalist. This book, therefore, acutely addresses themes relevant to all the societies across the Americas. Written in exile after a United States invasion put down a movement that sought to return the democratically elected Bosh to power, The Social Composition of the Dominican Republic is a fundamental primary source for understanding the history of Latin American social and political thought during the Cold War. Even four decades later it also remains an illuminating analysis of history, class relations, and the predicaments of modernization in the post-colonial Caribbean. This elegant English translation will introduce a new generation of students to Bosch, and to the long scope of Dominican history. Wilfredo Lozano’s excellent introduction offers a wide-ranging and accessible guide to the origins, impact, strengths, and weaknesses of the text. Juan Bosch,(1909-2001) the first democratically-elected president of the Dominican Republic, was a politician, historian, writer, and educator. Before his election, he led the exiled Dominican opposition against the dictator Rafael Trujillo. He is remembered as one of the most influential figures in Dominican politics and letters.